← Daughter of the Blood, by Anne Bishop – a review. The game – produce an anthology of fifteen stories. The rules – they must be short stories, they must include at least one supernatural creature such as a shapeshifter, fairy, vampire or ghost. They must include a strong element of a game or a sport. No author can contribute more than one story. And thus was born ‘Games Creatures Play’ an anthology of fifteen stories, bracketed by Charlaine Harris’s ‘In The Blue Hereafter’ at the beginning, and Toni L.P. Kelner’s ‘Bell, Book and Candlepin’ at the end. There is a great deal of variety in the stories, as you’d expect from such a wide brief. Some of the stories are all about the game or sport. Others, including those from the two editors, use the games as a background against which the story develops. 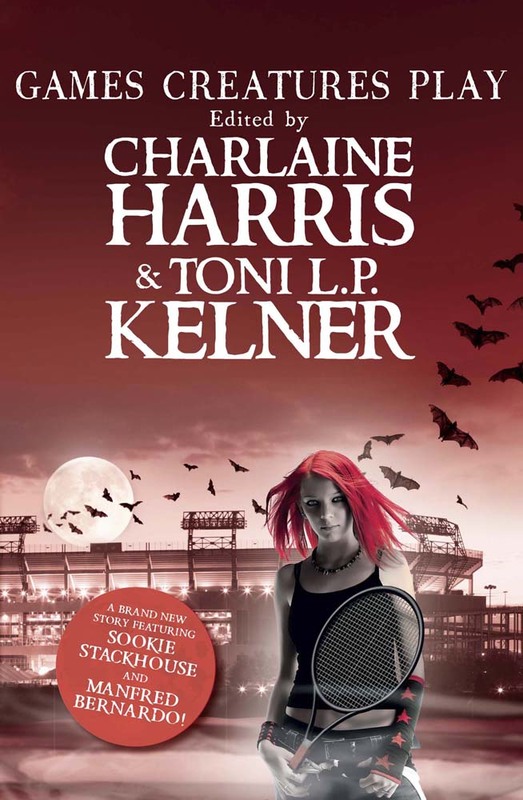 Harris’s story is a Sookie Stackhouse tale, nestled closely into the True Blood universe and its existing characters and mythos. It works nicely as a stand alone, whilst enticing a captured reader deeper into the bigger picture. Kelner’s story works in a similar way, and I was surprised to find that it’s only her second venture into this particular world of the Allaway Kith. There are some interesting ideas in this story, that I’d love to see explored further. Most of the contributions to this collection are set in the approximate present of the 20th and the early 21st century. The exception is Dana Cameron’s ‘The God Games’, a story about a man travelling to the Olympic Games of ancient Greece, on a vital mission. The games and the sports are richly and authoritatively described, but take a back seat to the plot and the characters. Anthologies are made for dipping into, and a change of tone is welcome from one story to another. We certainly get that. There are several stories with a strong dose of humour, including Scott Sigler’s story about an unconventional supermarket exorcism, ‘The Case of the Haunted Safeway’; Mercedes Lackey’s entertaining yarn, ‘False Knight on the Road’ about a Prohibition era bootlegger getting into a motor race with the wrong person; and ‘Hide and Shriek’ in which Adam-Troy Castro plays fast and loose with the concept of apocalypse at the hands of a group of very mixed ability demons. Brandon Sanderson’s ‘Dreamer’ is a bloody and violent story, well paced and packed with action, as befits a ‘capture the flag’ challenge. Of course, an anthology about the paranormal shouldn’t be without its dark side, and we get that in spades, kicking off with ‘Hide and Seek’ by William Kent Krueger, a particularly nasty yet atmospheric telling of innocence lost and hope abused that left me looking for a kinder story to end the night on. If you like your horror uncompromising, this one’s for you. Joe R Lansdale’s ‘Dead on the Bones’ is another story of innocence lost, but it’s treated in a very different manner. For me, this is one of the stand out stories of the anthology. The characters are well drawn, the setting is exotic enough to fascinate, and the protagonist is both sympathetic and appealing. Moving on to team games, the dark theme continues with ‘On The Playing Fields Of Blood’ by Brendan Dubois, a well managed mixture of bloody history, lacrosse, revenge and betrayal across the centuries. Ellen Kushner tackles a similar idea in ‘Prise de Fer’. The sport is fencing, the insult to be avenged is very personal, and the location has moved from the mountains of North America to a finishing school for young ladies in France, but the anger is the same. I particularly enjoyed Kushner’s story for its technical details of the sport, and the very satisfying ending. Vengeance is a hot topic, unsurprisingly in a book about competitive sports and games, and in Caitlin Kittridge’s ‘The Devil Went Down To Boston’ we find a heroine with many good reasons to seek revenge on a world that has let her down too many times. Finding herself backed into a corner, she uses her talents and the skills she has learned in her chosen field to take on the ultimate player of games. Jan Burke’s ‘Stepping into the Dead Zone’ captured me almost from the first sentence. It’s a beautiful story of friendship and loyalty, with a centrepiece school dodge ball game lovingly described in a way that sets the tone for the second part of the story. I got a sense of a world beyond this story, and would be interested in seeing it developed further. At this late point in the proceedings, I will confess that I am a fan of paranormal fiction, especially the short form, but I have very little interest in sport. And yet, Seannan McGuire’s ‘Jammed’ left me cheering on the young women in this Roller Derby story. The characters are a wild and lively mixture of normal and paranormal women, the challenge they face is made vivid and urgent, and the resolution is satisfying. This is another of the stories that turns the anthology into one for the shelves, because I want to re-read this story again and again. It’s great fun, and the protagonist is a memorable one. The penultimate story is Laura Lippman’s ‘Ice’. It’s place in the book is between the mayhem of ‘Hide and Shriek’ and the fast paced ‘Bell, Book and Candlepin’. It really does give the reader a chance to pause and gather energy before the final sprint to the end of the book. It’s a quiet story, touching only gently on the sporting theme of this collection. It’s a brilliant, heartbreaking little gem about the nature of story itself, and the manufacture of history at a very personal and local level. I loved it. ‘Games Creatures Play’ is out on 3rd April, published by Jo Fletcher Books. This entry was posted in Review and tagged anthology, Ghost, Horror, Paranormal, review. fantasy, vampire, vampires, werewolf, Werewolves, zombie, zombies. Bookmark the permalink.